Oh, my freaking God! How good this read was! I can’t get over how much I loved it. To begin with, Laini Taylor’s writing is phenomenal. Just fabulous, it’s vibrant, lively, playful, rich but not one bit overdone while still attracting all my fangriling rush! Faulous, fabulous writing! I was 100% into this book from the first line, pretty much. It was that good. It’s a third person narrative, mostly from Karou’s POV though with some inserts from others (few of them, though), and it’s just freaking fabulous. Seriously, read this if you haven’t, you need to experience the magnificence of this writing. *Inahles, exhales* Okay, I’m calming down now, lol. 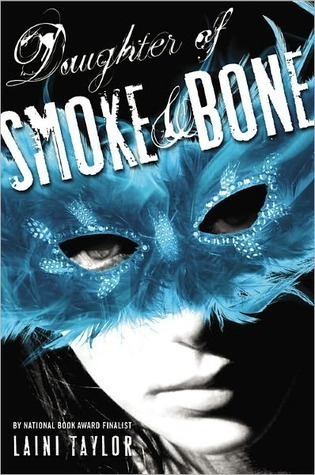 The worldbuilding of Daughter of Smoke and Bone is fabulous as well. Though I’m generally reluctant about angel-related stories, this one was pure win. The seraphims in this story are soldiers, as Akiva says himself a few times. They’re fierce warriors, pretty much, something of the Roman Empire equivalent for their world – they come with the gift of ‘civilization’ and take the land and its inhabitants as theirs as a result. Can you tell my country was historically invaded by the Romans, lol? But yeah, they’re that type. The chimaeras, equivalent of demons perhaps, are fabulous creatures. They keep the mythological aspect of being more than one type of animal meshed into one being, and Laini Taylor builds them fabulously. The supernatural element, paranormal and fantasy work in this novel are smooth and breathtaking. Not to mention the story took us to awesome places, Prague to begin with – it’s a fabulous city – but also exotic Marrakesh, not to mention the Eretz part of the story. Another big shining star for the read on this account as well. Karou was lovely. I don’t often like 17 yo female MC’s, I sometimes have issues connecting with them. I had no issues connecting with Karou, she was smart, witty, spunky and artistic. I got her, I got her thinking, her feeling, her insecurities and desires – eeeeverything made sense to me, which is a rarer occurrence when it comes to YA. I loved her, scratching fits wished upon Kaz and all 😀 I might have liked her even more because of it. What I mostly loved about her though was the fact she was a unique. You know how some strive to be a type, and some don’t? She was a unique, and I deeply, deeply love unique. She was deep, layered, complex, but also fun and just a bit frivolous in places where it made sense to be. Karou was an awesome character, and I loved her. Akiva was also interesting, but I can’t say I got very much into him. Maybe it was the whole soulless aspect of his entrance in the story, I dunno. I usually respond to harsh warrior types, but this guy didn’t strike a chord with me for some reason. He was cool, don’t get me wrong, kind of dreamy in places. But there was something about him that stroke as stoic martyr type, and I personally like the more snarling kickass variety. But again, he was well built and felt as authentic as a seraphim might. I really loved the chimaeras, Brimstone and Issa, and of course the Madrigal part of the story was lovely (and all fantasy). Aside loving Karou, I really loved Zuzana, and I really loved their relationship. The story was a beautiful mix of alert action, fantastic storytelling and touching moments. If I had to pick a favorite, I liked better the first say three quarters of the novel because the Prague set part of the story was somehow more fun. The Eretz related bit, the fantasy bit really, had that fantasy vibe that I’m not necessarily head over heels for on a personal note, but it flowed just as well as the paranormal part and I enjoyed it. Great fighting scenes, greatly handled emotional scenes, and an overall awesome work on the whole story. Curb appeal wise, the cover is interesting to me because it’s sort of stark, more on the minimalist side, a lot of contrast, some mystery going on with that mask (that you’ll totally get the meaning of as you reach the end of the novel). I’m not sure I’d be tempted to pick this up based on cover alone, but it certainly draws my attention. Of course, since this novel has been out for a while and I know lots of people loved it, my real motive behind reading was the fact I’d heard it was so good. And it is, it totally delivered. But anyway, from here, Laini Taylor writing might as well equal instant buy material. All in all, this was a fantastic read, rich in elements, action and emotion, and sporting some freaking fabulous writing. I say definitely give this a try, I believe it’s well, well worth it and will make you happy. It certainly made me fangirling happy 😀 I say it’s a must read. I loved this book! I actually listened to it on audio and I just loved loved loved the narrator I think she added even more to the story than if I had just read the words off the page myself. I love Akiva and Karou and the whole cast of secondary characters. I loved all of the elements of this story and how many surprises there were and there is so much yet to come. Great review! Glad you loved this book.